There are a handful of directors that hit their first film so far out of the part, their sophomore follow-up becomes an inevitable disappointment. Not so with Alex Garland, who made his directorial debut with Ex Machina four years ago. Of course, Garland had already pinned scripts to films Never Let Me Go and 28 Days Later. His eagerly awaited follow-up is larger in scale and budget than Ex Machina, but the way he toys with genres and challenging the viewer remains the same. Garland has crafted a film that might look like an Arrival sibling, but far more in the realm of Barry Levinson’s 1998 supernatural thriller Sphere. The performances don’t quite live up to Ex Machina but the ambitious nature of the production design and concepts are literally out of this world. Following a mysterious particle from space that lands on the shores of a US coastline. Lena (Portman), a biologist and professor, joins a team of scientists lead by psychologist Dr. Ventress (Leigh). This team is part of a military research facility studying the world altering event. So far, only one person sent into The Shimmer has returned. This latest team will enter with no more knowledge than the previous groups, but the same goal of understanding the event, its purpose, and how to prevent it’s spread. Lena joins under somewhat false pretense, not offering up her ex-military experience. Nothing can prepare the team for the beautiful horror they find inside the forest. A combination of CGI and physical composition, I can’t imagine any other film this year out matching the imagination this film conjures on screen. 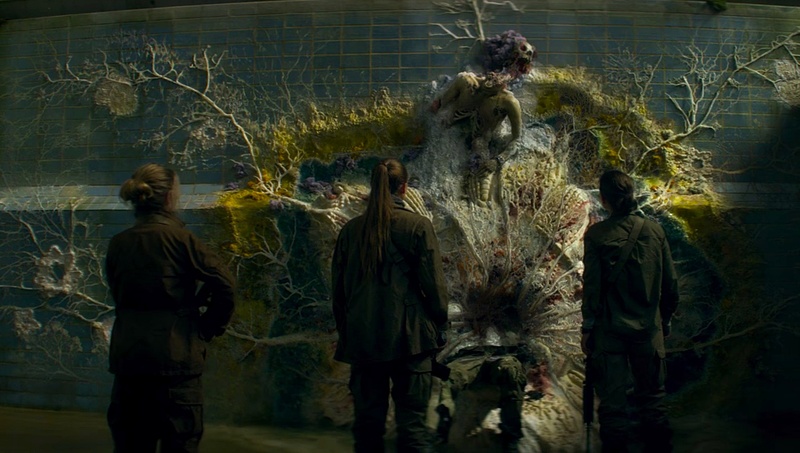 Annihilation is a science fiction mystery that isn’t afraid to tap into horror elements. There are a handful of well executed moments of pure terror in the film, not to mention a realistic embrace of realty where blood and gore are concerned. The greatest suspense for the film is one we share with the characters, wondering what the heck everything means. Lena guides the audience perspective with her point of view. She is our flawed tour guide into unknown territory. Isaac (Star Wars) reunites with Garland and while his presence certainly gives the film a prestige factor, this is Portman and the supporting women’s show. While Garland has adapted the film from Jeff VanderMeer’s trilogy, he refused to read the book as not to tangle the two visions. The most impressive takeaway was the set and production design. A combination of CGI and physical composition, I can’t imagine any other film this year out matching the imagination this film conjures on screen. From forest decoration that includes rainbow like spores to indescribable walls inside the lighthouse, the artistry runs wild in nearly every scene but one. The same team that won an Oscar for visual effects on Ex Machina are back with their thrifty innovative designs. The restrictions on budget are likely what drives the creativity behind Garland productions, his films define the less is more concept. Annihilation is the type of engrossing work that repeat viewings will likely yield more depth and understanding. Dazzling to watch, filmmaker Alex Garland has created another engrossing sci-fi puzzle.